Jenkins, Philip. Synthetic Panics: The Symbolic Politics of Designer Drugs. New York: New York University Press, 1999. Knowles, Cynthia. 2001. 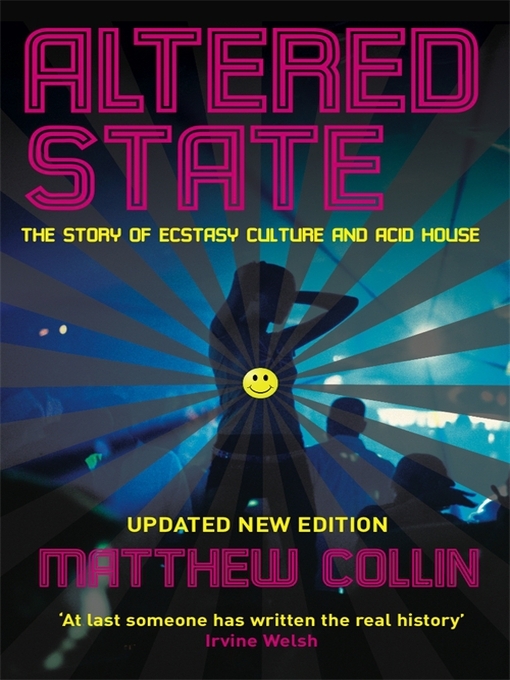 “Up all Night: A Closer Look at Club Drugs and Rave Culture”. Geneseo, N.Y: Red H Press. Saunders, Nicholas. Ecstasy and the Dance Culture. Exeter: BPC Wheatons, 1995. Connolly, William E. “Drugs, the Nation, and Freelancing: Decoding the Moral Universe of William Bennett.” In Drugs and the Limits of Liberalism: Moral and Legal Issues, edited by Pablo DeGreiff. New York: Cornell University Press, 1999. Grayson, Kyle. 2008. “The (Geo)Politics of Dancing: Illicit Drugs and Canadian Rave.” In Chasing Dragons: S Identity, and Illicit Drugs in Canada, edited by Kyle Grayson. Toronto: University of Toronto Press. Hemment, Drew (1997) e is for Ekstasis. New Formations, Spring (31). pp. 23-38. Kavanaugh, Philip R. 2006. Solidarity and drug use in the electronic dance music scene. M.A. Thesis (Cult Anthropology), University of Delaware. Pini, Maria. 1998. “Peak Practices‘: The Production and Regulation of Ecstatic Bodies.” In The Virtual Embo Presence/Practice/Technology, edited by John Wood. London: Routledge, 168-177. Wright, M. A. 1998. “The Great British Ecstasy Revolution.” In DIY Culture: Party and Protest in Nineties Britatin edited by McKay, George. London: Verso, 228-242.